InterExchange Work & Travel New Zealand now offers an optional group Welcome Week, including Auckland-based activities and a trip to the Bay of Islands, for those who want to see and do more in their first week on program! 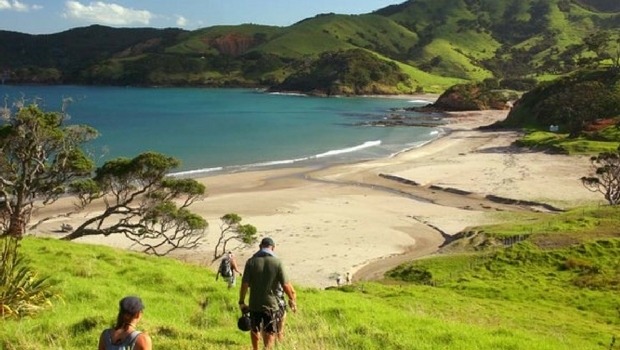 Participants enjoy one of New Zealand's beautiful beaches. Kia Ora and welcome! You will be shuttled to the your hostel located in Auckland's Central Business District, just a few minutes from the program support office. The hostel has free Wi-Fi. You'll have time time freshen up, go for a walk, and settle in. After your free breakfast, you'll head to your support hub in Auckland for your Work & Travel orientation session. You'll get your bank account and tax ID number squared away and have a comprehensive presentation covering your job search, traveling in New Zealand, and more. In the evening, you'll meet with your guide who will brief you on all the exciting activities for the week! You'll also enjoy a Welcome Dinner in town that evening to get to know your new travel mates. Views of Auckland, New Zealand. Meet your guide in the morning for a comprehensive walking tour through the city of Auckland. You'll learn about the city's history and contemporary culture, as well as check out some awesome spots. 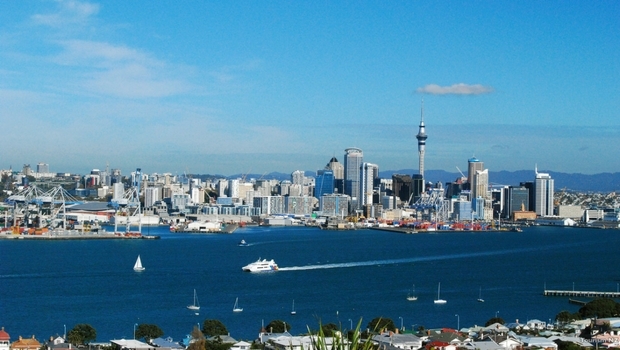 The tour ends at the Auckland SkyTower, where you'll ascend 220 meters into the sky for breathtaking views of the city. Finally, the big trip north! The Bay of Islands is a subtropical micro-region surrounded by turqoise waters and known for 144 beautiful islands. You'll be based in the township of Paihia, a laid back town with famous sailing, fishing, nature walks, dolphin swimming and relaxation. You'll stay at the Pipi Patch backpackers hostel, known for its friendly staff and a lively environment. In the afternoon you can relax or stroll into town. In the evening you'll have a group dinner and discuss the itinerary for your overnight cruise! Exploring the Bay of Islands. Use this morning to sleep in a bit, or venture down to the beach to soak up some rays and splash about. Later, jump on board the cruise, where you can have a few drinks and enjoy the 2-3 hour cruise through the islands, then enjoy a Kiwi BBQ with your group. As darkness falls you can hang out for an amazing star-gazing session where your guide will point out constellations, planets & galaxies. For the more adventurous have a night sea swim or kayak and then warm with a drink by the fire. Wake up early to watch the sun rise over the ocean (or catch it from bed!). Meet for a traditional Kiwi breakfast and then haul anchor and get underway for an exploration of the islands. Before getting started, you are free to join the crew for an early morning swim. Get ready for kayaking, snorkelling, gathering fresh sea food, exploring WWII remains, trekking across islands enjoying stunning vantage points and visiting ancient Maori fortifications. If conditions allow, you'll gather mussels from the kelp-covered outer reefs to enjoy on the way home (along with the unique experience of eating sea urchins raw, if you're brave enough). You will have time to enjoy the remote beaches - perfect for a game of beach cricket or volley ball. On the homeward cruise, you'll enjoy those mussels, freshly steamed, and watch out for the abundant marine and bird life (maybe dolphins if you cross your fingers)! You'll arrive back at Paihia wharf in the afternoon and will be checking back into the Base Pipi Patch for your last night together before heading back to Auckland (free drink tickets included). Take in the sunrise and contemplate your many amazing months ahead in New Zealand! Take it easy in the morning and board the bus for your trip back to Auckland, from which you'll have the support from the team regarding your job search and onward travel plans. From day seven, it will be your choice where you travel, live, work, and play, but support will always be available throughout your Work & Travel New Zealand program! Accommodation is optional on this night at Nomads Hostel in Auckland, at $35. Join a Frenzi bar crawl which runs every Thursday. We aim to adhere to the schedule above, but due to seasonality and group size, activities are subject to change.